Gabriel Levy on the phenomenon of Jeremy Corbyn, the 2017 UK election result and what it means for the prospects of the working class. Che Guevara is so last year. 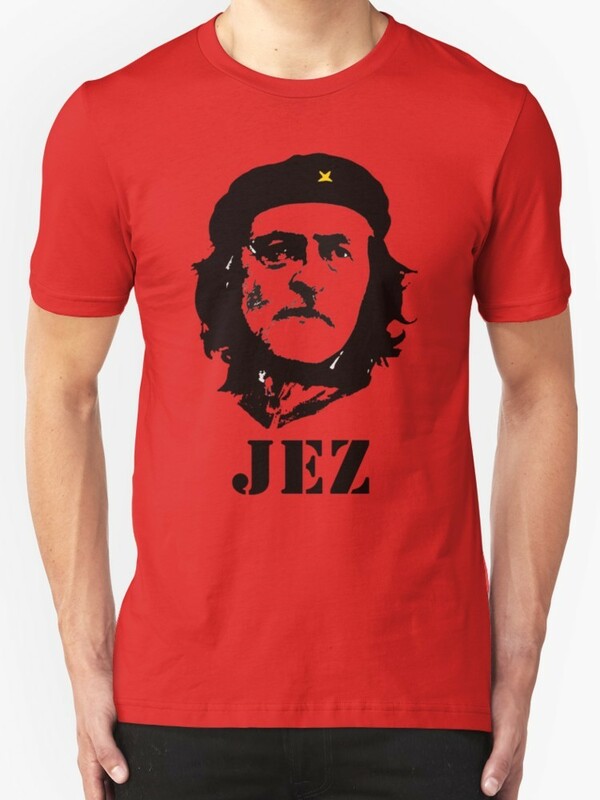 It’s Jeremy Corbyn on the T-shirts now. And he has a gig coming up at Glastonbury. Corbynismo has turned the British political circus upside down. The Tory party, having been reduced to a parliamentary minority after its disastrous election campaign, is struggling to contain the anger provoked by the Grenfell Tower fire. People are reacting to the cruel injustices on which this vile government thrives. Some Tories see continuing Theresa May’s “leadership” as the best hope for at least retaining a hold on government. Others have the knives out for her. None of them seem to have a clue about how to deal with the Brexit talks. The Tory chaos is a wonderful reminder that our enemies, too, have weaknesses and suffer crises. Corbyn and the Corbynistas – the mostly young people swarming into Labour – have helped to produce this impasse for the Tories. For a start, the Corbynistas played a prominent role in the campaign to get young people who had never voted to register. Then they shifted the election campaign agenda away from Theresa May’s rancid “strong and stable” slogan, to focus on austerity, National Health Service cuts and education. Things that matter. Another turning-point was the publication of Labour’s election manifesto, easily the most left wing one since the 1970s. It won support both from young first-time voters and much (but not all) of Labour’s older working-class support base. Now, with the Tory government wounded, perhaps fatally, the prospect of another election, and of a Corbyn-led government, is being discussed in the establishment’s own media. Every one of Theresa May’s inept blunders brings up the question: what would Corbyn do? ■ The parliamentary system. Labour has lost its grip on Scotland’s parliamentary seats, where until 2015 it could be guaranteed almost 50 seats. Obviously this is the legacy of Blairism, its embrace of capital and its criminal disregard for working-class Scots. They felt, and feel, betrayed by the Labour Party that had historically represented them. Labour regained some Scottish seats this year, but in future it will have to compete with the SNP, and now the Tories, in Scotland. Labour’s one-party fiefdoms in parts of England were also cracked open in 2015, by UKIP. While, thankfully, UKIP collapsed in this year’s election, the organic connection between Labour and its support base has been disrupted. So, say people who do the parliamentary arithmetic, the chances of Labour winning an absolutely majority (326 or more seats) remain very very slight. ■ The Labour Party machine. Those who populate it despise Corbyn and much of what he stands for. While I suppose they would be happy with reversing some of the Tories’ more extreme austerity measures, many of them can be relied upon to obstruct many of Corbyn’s more radical policies, such as raising the minimum wage, renationalisations and acting against zero-hours contracts. This machine dominates the Parliamentary Labour Party. Corbyn will rely on their votes, too, for getting stuff through parliament. The machine is also organically hostile to the sort of alliances that many Corbynistas see as natural. It expelled three long-standing Labour party members for the horrendous “crime” of supporting a non-Labour anti-cuts candidate against Jeremy Hunt, the revolting Tory health secretary. While the Greens stood aside for its candidate in Brighton Kemptown, one of the town’s constituencies (and didn’t get so much as a “thank you”), Labour did its best (but failed) to unseat Caroline Lucas, the Green MP for Brighton Pavilion. ■ Corbyn’s political pragmatism. During the election campaign, Corbyn dealt with the perils of being a left-wing leader with a right-wing machine, in part, by shifting his political ground. As the New Statesman’s deputy editor Helen Lewis pointed out, Corbyn “went into the election promising the most right-wing Labour policy on immigration in more than 30 years”. He “embraced” the NATO military alliance. On keeping Trident and on keeping the monarchy, he said (truthfully) that his own views were at odds with Labour’s manifesto. How much more pressure would Corbyn be under to bend his views, if he became prime minister? ■ Corbyn’s political formation and closest collaborators. Corbyn has always been associated with the “old” Labour left, that believed that socialism could be achieved through parliament, and was strongly influenced by the Communist party and its post-1990s remnants. He was steadfast in support of working-class struggles right through the 1970s and 1980s, and never hesitated to take a firm stand e.g. on opposing British military violence in Ireland, without regard to what the political circus thought. But Corbyn also, like Tony Benn before him, always believed in left parliamentarism. And he always saw the Stalinist-led Soviet Union as a bastion (albeit imperfect) of human progress. (See comments at the end of this article.) The remants of this world view – that regimes that oppose US imperialism, no matter how dictatorial, are somehow on our side – has led him to espouse horrible views on e.g. the war in Kosovo in the 1990s or the role of the Assad government in Syria. Members of Corbyn’s inner circle, such as the former Guardian journalist Seumas Milne, more firmly embrace Putin-esque campist politics. The closer Corbyn gets to getting elected, the more important it is to be clear about how these constraints operate. Alexis Tsipras, who was buoyed by a surge of militancy when he became prime minister of Greece in January 2015, was similarly constrained. Within a year he was negotiating a deal by means of which the IMF and other international lenders to the Greek state imposed an austerity regime of unprecedented severity. A lesson of that experience, in my view, is that we must not let the social movements developing in the UK now – in opposition to austerity policies, and around such issues as the Grenfell Tower fire and racism – become levers in Labour’s hands, as it plays the parliamentary game. That will limit those movements, cramp their vision, undermine their creativity. It’s not as though we don’t have some British history to learn from, too. While universal suffrage and other democratic rights were the outcome of working class people’s struggles, parliamentarism was historically a mechanism of social control. (More on that here.) The Labour Party functioned as part of that mechanism. The social movements now taking shape could not only confront the heartless, headless Tory government (for however long it lasts), but also find the means to transform society in a way far deeper, far more profound, than the limited things that can be achieved through parliament. It would be a tragedy if Corbynismo becomes a way of hitching these movements to the parliamentary bandwagon. John McDonnell, Corbyn’s deputy, says that the Labour party is now “changing into a social movement”. I don’t think so. Sure, Corbyn addressed huge, inspiring rallies before the election. But election rallies don’t by themselves make a movement. Any social movement must surely be much bigger, politically wider, and adventurous in its view of changing the world, than the Labour party. One answer to “what would Corbyn do?” is “that matters less than what we do, now”. GL, 20 June 2017. It's a fad. When Corbyn goes, so will the support. Political education is what is needed. Nothing airy-fairy about it. The link that AngryWorkersWorld posted seems dead now.